This heart-warming story is about the challenge of accepting difficult and confronting change. 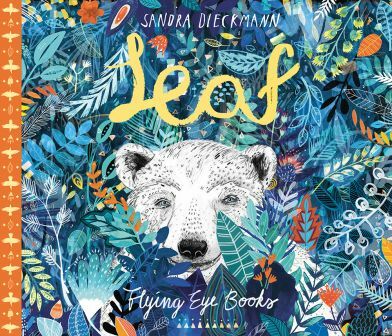 This picture book, with its bright, intricate and surreal illustrations, shares the plight of a displaced polar bear that unexpectedly finds temporary asylum in the woods to the consternation of other wildlife, which fear and avoid it. Finally, in a literal leap of desperation, the animals empathise with the polar bear’s vulnerability and help him return to his home. The book highlights the insecurities we all feel at a time of rapid and disturbing change where polar bears, and indeed many people around the world, are being displaced from their homes as they face the consequences of corporations refusing to act on the climate change emergency. Author Yanis Varoufakis, the former Greek finance minister who dealt with Greece’s debt and austerity crisis in 2015, writes to his teenage daughter Xenia about the “beast of capitalism” and how it perpetuates inequality. Varoufakis explains how capitalism dates back to antiquity when societies were transformed by agriculture. The agricultural revolution created surplus grain that needed storage and this gave rise to the need for writing in order to record the amount each farmer deposited in the shared granary. This surplus economy created debt, money, and credit. However, all states emerging from the agricultural revolution distributed their surpluses in an outrageously unequal manner that benefited the few in power. But, if the impoverished farmers decided to join forces they could easily overthrow the ruling class. One way to maintain power, besides brutal force, has been the cultivation of the ideology that persuades the majority to believe, deep in their hearts, that only their rulers have the right to rule. For Varoufakis, economics is always politics, because whoever controls the money has the power. Workplace fights are important because in essence they are about one of the deepest of human emotions, dignity. The day-in, day-out degradation of peoples’ self-worth is why joining in union solidarity and taking action can be so liberating. US trade unionist, community activist and scholar Jane McAlevey considers why progressive politics has experienced a four-decade decline in the US, with the rise of the worst and greediest of corporate interests. One reason, besides the incessant attacks and undermining of unions, is because unions have moved away from “deep organizing” towards “shallow mobilizing” and failed to develop strong relationships with the wider community. The heart of good unionism, McAlevey argues, is understanding the power structures of ordinary people and how they come to understand their own power when they refuse to work in servitude and obedience to the “priestly-kingly-corporate class”. The strike, she argues, remains one of ordinary workers most powerful weapons. Although this is a book of case studies of successful union action in the US, it has many salient lessons for the Australian union movement. McAlevey’s case study about the transformative 2012 Chicago Teachers Union strike is particularly inspiring. She argues that there are no shortcuts to lasting social change, but “organising” and “more organising” that empowers ordinary workers to be at the centre of their own struggle. A must-read for all teacher unionists working to create a better world. All three books are all available from Federation’s library. A student: thinks imaginatively, creatively and interpretively about information, ideas and texts when responding to and composing texts. Why do the animals fear the polar bear? What makes them change their mind about the polar bear? What lessons do the animals learn about helping the polar bear? Role-play interviewing the animals in the story about their promise to tell Leaf’s story. Make a recording of a “David Attenborough” voice-over describing the animals and their interactions in the woods. Write a poem about the story. A student: briefly outline each of the following ideas: capitalism, socialism, egalitarianism, nationalism, imperialism, Darwinism, Chartism. What sort of father do you think Yanis Varoufakis wants to be to his daughter Xenia? What have been some of their happier times? Why has Yanis Varoufakis written this book about economics to his daughter? Write the questions that Xenia asks her father about the history of capitalism. Do a timeline listing the key events described in the book. Role play an interview with Yanis and Xenai about the history of capitalism. What are the similarities and differences in the US union movement and the Australian union movement? Why is organising at the school level so important? What can we learn about the power of teachers from the Chicago Teachers Union? Organise a school meeting to discuss the ideas and how they can assist with the Fair Funding Now! campaign, seewww.fairfundingnow.org.au. Attend your local Teacher Association meeting requesting an agenda item to allow discussion about the ideas from this book to share with other teachers. Get a large delegation of Federation members to attend your P&C meeting to talk about why Fair Funding Now! matters.